Recently, I was lucky enough to sell a couple of pitches to KaBOOM!’s new comic based on Cartoon Network’s Emmy-winning series REGULAR SHOW. Of the pitches I sent in, two were approved. One, “Sombrero World,” was approved and will run in an upcoming issue with art by Brad McGinty, with whom I’m also doing a story for KaBOOM!’s ADVENTURE TIME comic. Zack is living large! The other approved pitch wound up being rejected in script form. I’d already talked with artist Michael Dialynas (AMALA’S BLADE at Dark Horse Comics) about illustrating it, and he did a design of the main characters Mordecai and Rigby that you can see below. I don’t know the reason for the rejection, but I don’t own the property and that’s Cartoon Network’s prerogative. That said, I hate to let work go to waste, so here’s the script below along with Michael’s designs. He’s doing a cover for an upcoming ADVENTURE TIME comic, and we hope to work together on another story in the future. PANEL ONE: MORDECAI AND RIGBY are in the living room of the park house playing video games. In the background, POPS comes down the stairs. RIGBY: Up, up, down, down..
PANEL TWO: Mordecai and Rigby high-five as Pops looks on aghast. 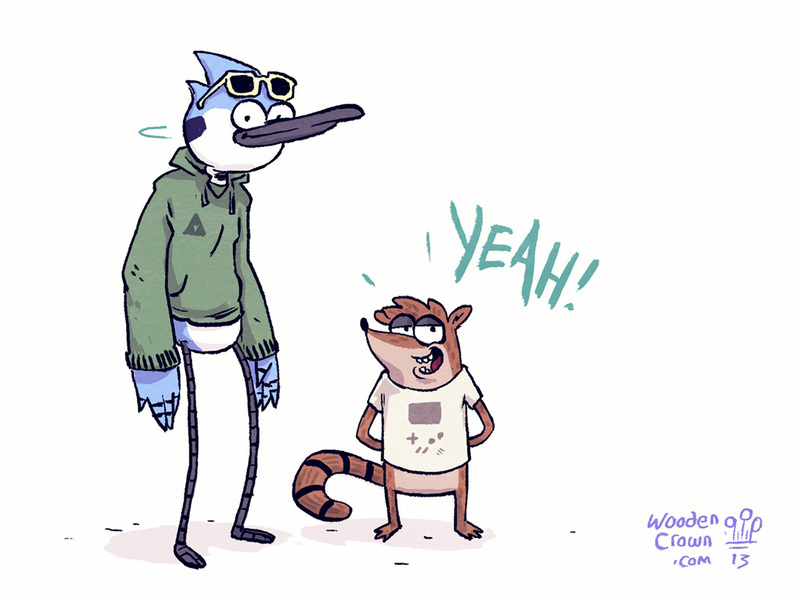 MORDECAI AND RIGBY: …KNOW WE DOIN’ RIGHT! PANEL THREE: A horrified Pops rushes up to Mordecai and Rigby, who have turned to look at him. POPS: STOP! STOP! YOU DON’T KNOW WHAT YOU’RE DOING! RIGBY: …getting 30 extra lives? PANEL FOUR: Closer on the three as Pops explains. POPS: You can’t go around talking like this! It’s THE ANNUAL GRAMMAR SOLSTICE! PANEL SIX: Mordecai and Rigby exchange a skeptical look. PANEL ONE: Mordecai tries to reason with Pops. BENSON AND SKIPS have entered the room; Rigby’s leaned back over the couch to speak to them. RIGBY: Yeah, Benson, Skips – you know anything about this? PANEL TWO: Benson looks irate and Skips has his usual grave expression. SKIPS: Never heard of it. Ever. BENSON: That’s the stupidest thing I’ve ever heard of! PANEL THREE: A horrified Pops points at an apologetic Benson. POPS: You…you just ended that sentence with a PREPOSITION! PANEL FOUR: Benson’s eyes are closed as he rubs his head with his hand, trying to restrain his frustration. The others are turned away listening to Pops. POPS: My father told me all about this when I was a young boy! You must always use proper grammar on the advent of the grammar solstice, or an evil monster will eat your SOUL! PANEL ONE: Mordecai, Rigby and the others walk away from a startled Pops in disgust. MORDECAI: Pops, your dad was just messing with you! RIGBY: Yeah, there’s NO SUCH THING as a Grammar Solstice! PANEL TWO: Pops stands there alone, devastated. PANEL THREE: LATER – Mordecai and Rigby are talking by the lawn mower as an eager Pops “pops” in on the right side of the panel. PANEL FOUR: LATER STILL – As before, Skips is interrupted while on the phone by Pops (who “pops” in from the left side this time, or at least a different angle from the previous page). PANEL FIVE: EVEN LATER: Benson, with clipboard, is giving directions to the off-panel park workers, when Pops “pops” in, this time from some impossible angle (like upside-down from the top of the panel). BENSON: …how did you even know that? PANEL ONE: LATER – everyone’s gathered by the front steps staring irately at a frantic Pops. MUSCLE MAN AND HI FIVE GHOST have joined them, also irate. MORDECAI: Pops, you’re driving everybody crazy! PANEL TWO: On a horrified Pops as he is overwhelmed by BAD GRAMMAR from the off-panel park workers. MUSCLE MAN: (from off) I can’t not get any work done! SKIPS: (from off) It’s a mute point! BENSON: (from off) I’m literally about to explode! PANEL THREE: Everyone looks up as AN UNDERWORLD PORTAL OPENS IN THE SKY. PANEL FOUR: The red-skinned head of THE PEDANTICORE emerges from the portal. It is a slightly intellectual head and face with glasses, etc., possibly some sort of hat. I keep thinking of the teacher in the “Another Brick in the Wall” video. It has three rows of sharp teeth and is smiling. It speaks in a sort of dignified, Old English-looking font. PANEL FIVE: BIGGEST PANEL OF THE PAGE: The Pedanticore’s full form now hovers over the terrified park workers. 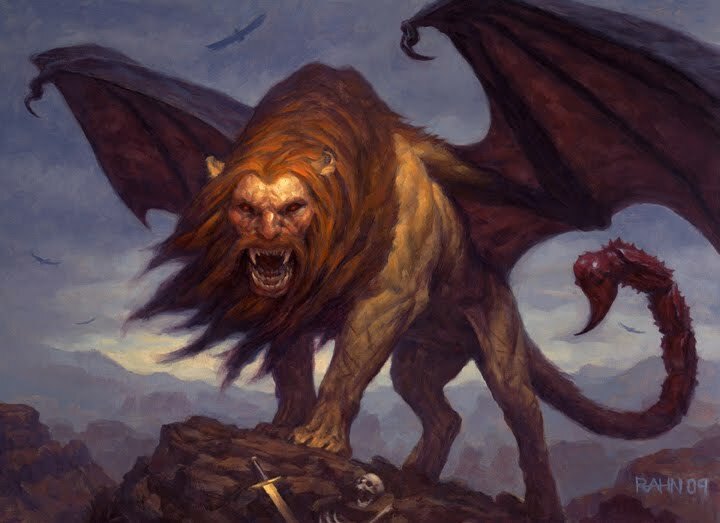 It is sort of based on the classic mythological monster the Manticore (here is the fiercest image I could find), with a red lion-like body, giant bat wings and a scorpion tail. PEDANTICORE: Lamentably, you have transgressed the accords of the Annual Grammar Solstice, forcing me to seek satiety from the mastication of your essences! PANEL ONE: The Pedanticore’s paw points at a startled Pops as the other park workers look at him. Rigby is still confused by the Pedanticore’s announcement in the previous panel. PEDANTICORE: Your grasp of the fundamentals of linguistics is utterly nonpareil! PANEL TWO: GREEN RAYS from the Pedanticore’s mouth hit all the park workers except Pops, who stares in horror. The park workers react in agony to the Pedanticore’s rays. PEDANTICORE: But now…I must sup! RIGBY: Ahhgh! I’m going to die…and I don’t even know what he’s saying! MORDECAI: We should have listened to Pops! PANEL FOUR: An angry Pops points up at a startled Pedanticore. POPS: You may not feast upon my friends’ souls, you ostentatious ninnyhammer! PANEL FIVE: The Pedanticore reacts with anger toward Pops, who stands his ground. PEDANTICORE: You dare contest my assertion upon these inarticulate ignoramuses? POPS: Indeed! I postulate that none may lay claim to being without moments of maundering dissertation! PANEL ONE: The Pedanticore reacts in disbelief at a smug Pops. PEDANTICORE: Poppycock! My elocution is irrefutably authoritative! POPS: Ha! Only a cretin would proclaim to be invariably infallible! PANEL TWO: Flames roar around the Pedanticore as it gears up for its assault on Pops. PEDANTICORE: This aspersion will not stand! PANEL FOUR: The Pedanticore IMPLODES into the portal! PEDANTIORE: NOOOOO – THIS ISN’T CRICKET — ! PANEL FIVE: The park workers have collapsed in a big pile. Pops is most cheerful. POPS: Quite all right! And you all taught me that one cannot simply force proper grammar on others! POPS: It must be learned. PANEL SIX: The other park workers just lie there in a heap as Pops walks off. MORDECAI: Dude, is anyone else afraid to ever say anything again?